Inviting Cat Fawns Cutely, a photo by timtak on Flickr. The existence of these cats and their cute (schmaltzy?) gesture even in the late Edo suggests to me that the now famous Japanese cult of the cute (e.g. Akita, 2005; Kinsella, 1995) is not a recent media phenomena as the most famous Japanese critic points out (Yomota, 2006). These big eyed, almost mouth-less cute cats may have been one of the inspirations of Sanrio's "Hello Kitty" character. In any event cats are very popular in Japan. On reason for this may be that overt expressions of desire are only tolerated if they are accompanied by profession of weakness in the form of amae (fawning, behaving like a hungry kitten) which Doi (1971) argued is especially prevalent in Japan. Amae is above all a non-verbal expression, Doi argues, a "love-me, read my desire," beam, that the Japanese use to avoid individuation, overt requests and taking responsibility for them. I suggest that this cat may be amaeru-ing as it invites. It seems to me that the cat sends a message to potential customers that the proprietors want custom and financial reward, in a cute, feline, silent, subservient, and ingratiating way. But hold on! What off all the linguistic welcoming ("Irrashaimase")? I think that these linguistic communications are required to be stripped of desire. Irrashaimase means more like "thank you for entering our shop." This cat is saying "Oh, please, we so want you to come into our shop," and this is acceptable as long as it is not said in words. I think that this has less to do with the Japanese wishing to avoid individuation and responsibility than being a product of the usual Nacalian transformation espoused on this "burogu." As Watsuji (1937) argues, in Japan the person is associated with the face (or mask) where as language is public not private (Nakashima, 1999; 1997). Doi was a Christian and probably went to church and read a book and tried to identify with its hero: he had a narrative self. To him verbal expressions were overt and entailed a promise, that with making requests come obligations. From a Nacalian point of view however, this cat's face and gesture is making an overt request, and a silent promise. The rest of this text was largely adapted from the Japanese Wikipedia page but I see that the English Wikipedia page is even more detailed. 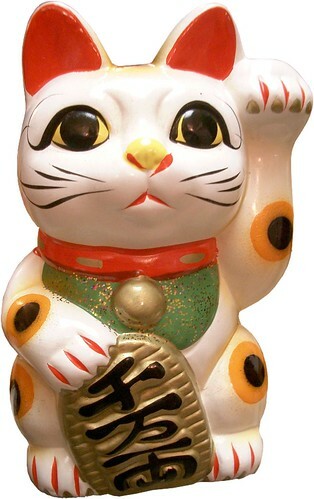 This cat is doing the downwards wave to invite with its left hand (while holding a traditional Japanese gold coin for the inflated amount of ten million "ryo") is inviting financial luck into a business establishment. Cats that are waving with their right hand (and not holding a coin) are inviting in customers. It should be noted that the common Japanese gesture to invite others is to wave downwards in this way. In the UK the downward motion of the hand in this gesture seems to suggest that the invitee is below the inviter and would normally only be used towards young children or dogs. There are a number of theories as to the origin of these (luck) "Inviting Cats" (Maneki Neko). One theory has it that a poor old lady living in the vicinity of Tokyo's Imado Shrine was forced to let her cat go. The cat appeared to the old lady in a dream saying that she should make a model of the cat which the old lady did. Her increase in fortunes encouraged others to do the same. There is a style of pottery called Imado ware, created in the vicinity of Imado shrine and these potters made many inviting cats. A feudal lord was passing a Tokyo temple (Goutokuji) in the rain when he saw a cat making the above gesture. The feudal lord sought shelter at the temple just before a thunderstorm and lightening took place. Grateful to the temple the feudal lord paid for its renovation. The temple for its part made a statue of the cat when it died. The good fortune of the temple became associated with the statue of the cat. In a variant of this story, the feudal lord was standing under the cover a tree that was subsequently hit by lightening when he saw the cat. Many inviting cats are offered at this temple to this day, but only of the non-financial right-hand-inviting variety. Another similar story concerns a cat inviting a Shogun into Jishouin Temple when said Shogun had lost a battle and had lost his way. The Shogun's subsequent good luck became associated with the inviting cat. It is probable that the pose originates in the natural facial grooming movement of a cat being mistaken for invitation. Somehow I can imagine a cat performing this gesture more emphatically in the rain so I am tempted by the Goutokuji theory but there is no way to tell. There are other origin stories associating these cats with other temples and shrines. Cats were associated with good luck in times past when the silk industry was still a major source of revenue due to their ability to eat the mice that ate silk-worms. Inviting cats are used as piggy-banks so their use encourages their owners to save and prosper. They usually found standing in business entrances. Coming from a country were no one would leave a piggy bank in an entrance hall for fear of theft, I wondered if they were somehow a theft deterrent that allowed thieves to take a small amount of loose change, which wrapped up in this cute facade, would make the robber feel guilty and discourage further theft. But now in retrospect I think that his was my biased interpretation. Akita. (2005). Cuteness: The Sexual Commodification of Women in the Japanese Media. In T. Carilli & J. Campbell (Eds. ), Women And The Media: Diverse Perspectives (pp. 44–57). University Press of America. Nkashima, Y. 中島, 義道. (1997). 「対話」のない社会―思いやりと優しさが圧殺するもの. PHP研究所. Watsuji, T. 和辻哲郎. (1937). 面とぺルソナ. 岩波書店.